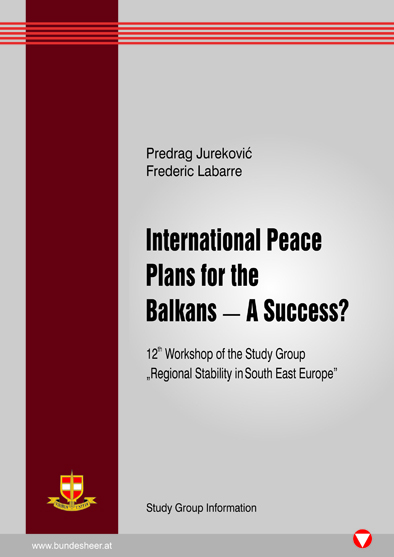 Bundesheer - Wissenschaftliche Publikationen - International Peace Plans for the Balkans - A Success? November 2005 marked the 10th anniversary when in Dayton, Ohio, the conflict parties from Bosnia and Herzegovina agreed on a peace accord, stopping a war that had caused 250.000 deaths and two million refugees. After the UN-brokered ceasefires and peace agreements in the conflict in Croatia, the Dayton Framework Agreement was the first in a long line of peace plans with which the International Community attempted to transform the chaotic and antagonistic region of the Western Balkans towards a more peaceful and co-operative area in the late 1990s and early 2000s. Comparable to the Dayton/Paris accords, which seek to preserve the unity of Bosnia and Herzegovina by creating two entities, the Bosniak-Croat Federation and the Serb Republika Srpska, stands the UN master plan for Kosovo that was defined by a military-technical agreement and the ensuing the UN Security Council Resolution 1244 in June 1999. Unlike Bosnia and Herzegovina, where none of the conflict parties had lost or won the war in a military sense, the Kosovo Albanians - with the support of the NATO air strikes - had clearly won the war against the Serbs. This fact has had deep implications on the Kosovo peace process and on today’s relationship between the Albanian majority and the Serb minority. In Southern Serbia and in Macedonia (FYROM), the International Community could prevent the fighting from spreading into a full-fledged civil war in 2001, between Serbs, Macedonians and Albanians through the Ohrid Agreement. Also in the case of Serbia and Montenegro the process of nation-building still influences political stability and interethnic relations. The Belgrade Agreement that was reached under the mediation of the European Union in March 2002 was not able to stop the disintegration of the state union. In May 2006 the majority of the Montenegrin electorate in a referendum voted for Montenegro’s independence of Serbia. The year 2006 finds the Western Balkan countries at a crossroad; some have taken the road toward Euro-Atlantic institutions; others seem to keep on being involved in ethnic and political conflicts. To prevent such a scenario of a divided and fragmented Western Balkan region it is important to discuss the issue, whether the peace plans, which represent the basis for the stabilisation process, are up-to-date, and which are the lessons to be learned from them. • What are the main reasons for the varying success in implement-ing the peace plans (internal and external factors)? • How strong are the peace plans interlinked? • Do the peace plans contribute to regional stability? • Is it necessary to rework or re-launch the peace plans? • What should these changes look like? The second part of this study deals with the role of important international factors in helping to implement the peace plans. In this regard especially, the changing role of the OSCE, the EU and the US in the process of peace-building is reflected.